The corn plant is one of nature's most amazing energy storing devices. It does this by producing a large efficient energy "factory" - the plant with its roots, leaves, stalk, and flowering parts - and then by capturing the sun's energy and storing large amounts of this energy in the grain, in a chemical form (largely starch) that can be used as an energy source by animals. Nature provides the major portion of the environmental influence on corn growth and yields. However, the corn producer can manipulate the environment with managerial operations including hybrid selection, soil tillage, crop rotation, soil fertilization, irrigation, and pest control. A producer who understands the growth and development of corn can use production practices to obtain higher yields and profit by being more efficient and timely. A producer who understands the corn plant can use production practices more efficiently and timely to obtain higher yields and profits. 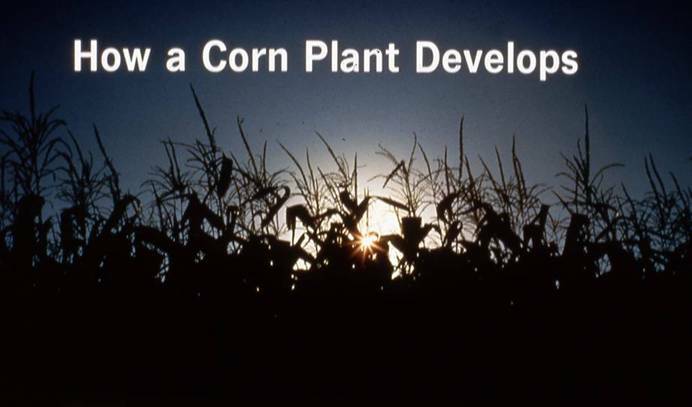 Corn Growth and Development poster. Order here. The staging system most commonly used is the Iowa System. It divides plant development into vegetative (V) and reproductive (R) stages (Table 1.). Subdivisions of the V stages are designated numerically as V1, V2, V3, through Vn, where n represents the last stage before VT (tasseling). The six subdivisions of the reproductive stages are designated numerically. Each leaf stage is defined according to the uppermost leaf whose collar is visible. Beginning at about V6, increasing stalk and nodal root growth combine to tear the small lowest leaves from the plant. To determine the leaf stage after lower leaf loss, split the lower stalk lengthwise and inspect for internode elongation. The first node above the first elongated stalk internode generally is the fifth leaf node. The internode usually is about one centimeter in length. This fifth leaf node may be used as a replacement reference point for counting to the top leaf collar. In a corn field all plants will not be in the same stage at the same time. Each specific V or R stage is defined only when 50% or more of the plants in the filed are in or beyond that stage. Although each stage of development is critical for proper corn production we will focus on VE, V6, V12, V18, R1, and R6. Table 2 describes the yield components being determined at each growth stage. V6 470 Kernel rows/ear "Factory"
Corn is perhaps the most completely domesticated of all field crops. Its perpetuation for centuries has depended wholly upon the care of man. It cannot exist as a wild plant. The greatest plant-breeding job in the world was done by the Native Americans. They developed types of corn adapted to so wide a range of climates that this plant is now more extensively distributed over the earth than any other cereal crop. One of the neat things about agriculture is the changing of the seasons. The fact that plants grow uniformly within a field during a cropping season, ripen synchronously, and are harvested at about the same time is truly amazing. The synchrony of development between and within plants is largely taken for granted by farmers. Yet synchrony allows a grower to spray herbicides, irrigate and most importantly harvest in a single operation. Synchrony is a remarkable feat of coordination by the plants. Days or weeks may elapse between tiller, spikelet, or floret initiation, and yet they flower at about the same time and grains ripen simultaneously within the span of a few days. The observed synchrony of crop development cannot be achieved without coordinated responses of a number of developmental processes (e.g. Leaf and ear development) to the environment. How this coordination between plant and environment is achieved is largely unknown in spite of widespread use of plant growth regulators. Current understanding of the molecular aspects of the control of plant development are poor at best. 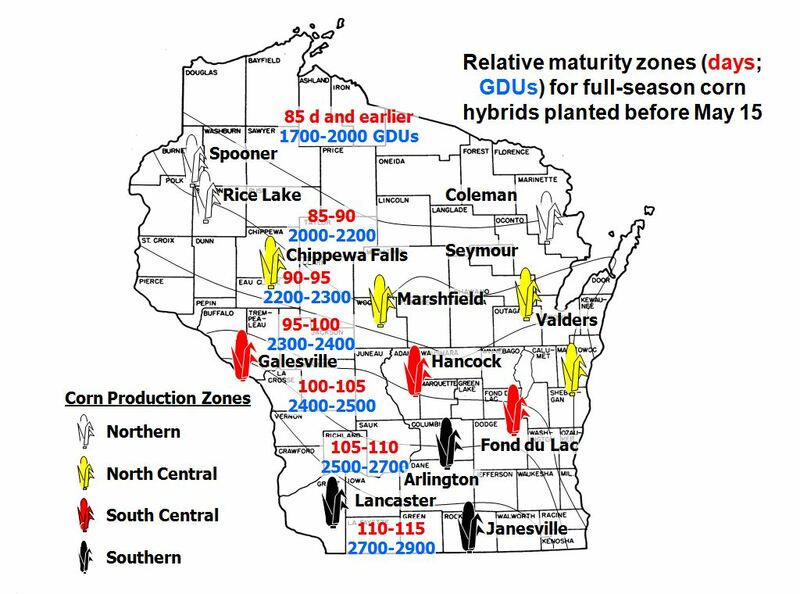 We will concentrate on an early to mid-season (90 to 100 day) hybrid for Wisconsin. Each plant typically develops about 20-21 total leaves, silks about 65 days after emergence, and matures about 120 days after emergence. All normal corn plants follow this same general pattern of development, but the specific time interval between stages and total leaf numbers developed may vary between different hybrids, seasons, planting dates and locations. An early maturing hybrid may develop fewer leaves or progress through different stages at a faster rate than indicated here. A late maturing hybrid may develop more leaves or progress more slowly than indicated here. The rate of plant development for any hybrid is directly related to temperature, so the length of time between the different stages will vary as the temperature varies, both between and within growing seasons. Environmental stress such as nutrient or moisture deficiencies may lengthen the time between vegetative stages but shorten the time between reproductive stages. The number of kernels that develop, final kernel size, rate of increase in kernel weight, and length of reproductive growth period will vary between different hybrids and environmental conditions. "Plant corn when oak leaves are as big as a squirrel's ear." "Plant corn when you can drop your drawers and sit on the ground for two minutes under a full moon." "Knee-high by the Fourth of July." "Pollinated by August, dented by Labor Day." 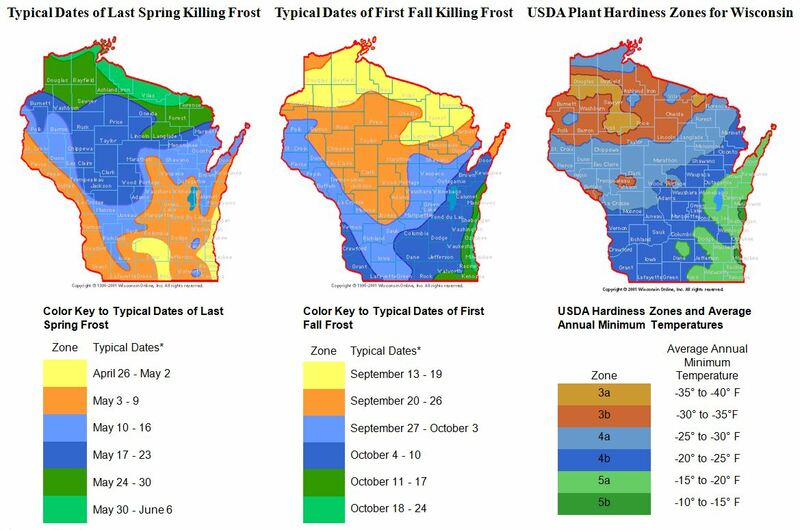 "Corn will dry down right when frost doesn't occur until after the first full moon in September." "Harvest when 8 of 10 ears float in a stock tank." Tmax = maximum daily temperature (upper limit = 86 F). Tmin = minimum daily temperature (lower limit = 50 F). Tbase = base or threshold temperature for corn growth. models (Pope, IC-492(8) p. 46, May 17, 2004). May 1 in the southern production zone of Wisconsin. accumulation for corn planted on May 1 in southern Wisconsin. particular year is greater than or less than normal once in five years. 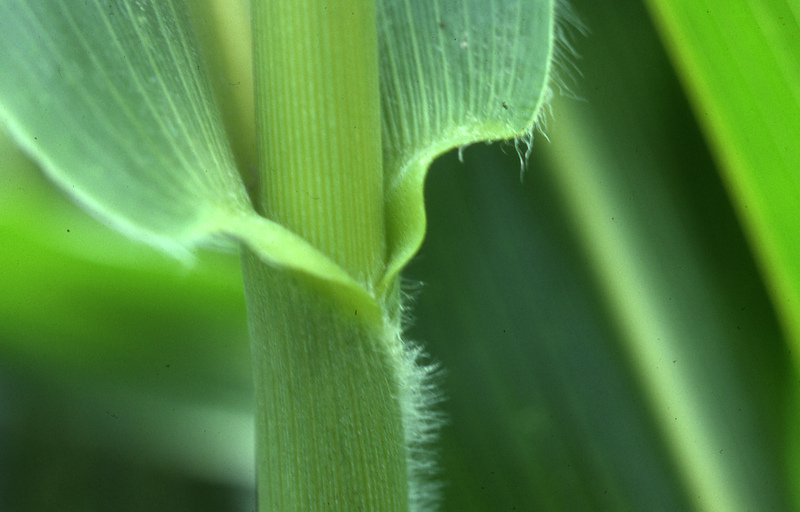 Corn plants increase in weight slowly early in the growing season. But as more leaves are exposed to sunlight, the rate of dry matter accumulation gradually increases. Cell division in the leaves occurs at the growing tip of the stem. Leaves enlarge, become green, and increase in dry weight as they emerge from the whorl and are exposed to light. The leaves of the plant are produced first, followed by the leaf sheaths, stalk, husks, ear shank, silks, cob and finally grain. By V10, enough leaves are exposed to sunlight so the rate of dry matter accumulation is rapid. Under favorable conditions, this rapid rate of dry matter accumulation in above-ground plant parts will continue at a nearly constant daily rate until near maturity. Highest yields will be obtained only where environmental conditions are favorable at all stages of growth. Unfavorable conditions in early growth stages may limit the size of the leaves (the photosynthetic factory). 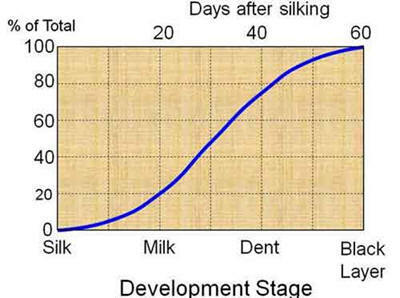 In later stages, unfavorable conditions may reduce the number of silks produced, result in poor pollination of the ovules and restrict the number of kernels that develop; or growth may stop prematurely and restrict the size of the kernels produced. Nodal roots are secondary roots that arise from belowground nodes. In cool soil banding small amounts of starter fertilizer to the side and slightly below the seed can improve early vigor, especially when soils are cool. Banding small amounts of starter fertilizer to the side and slightly below the seed can improve early vigor, especially when soils are cool. Brace roots stabilize the upper part of the plant and additional weight of the tassel and ears. Figure. 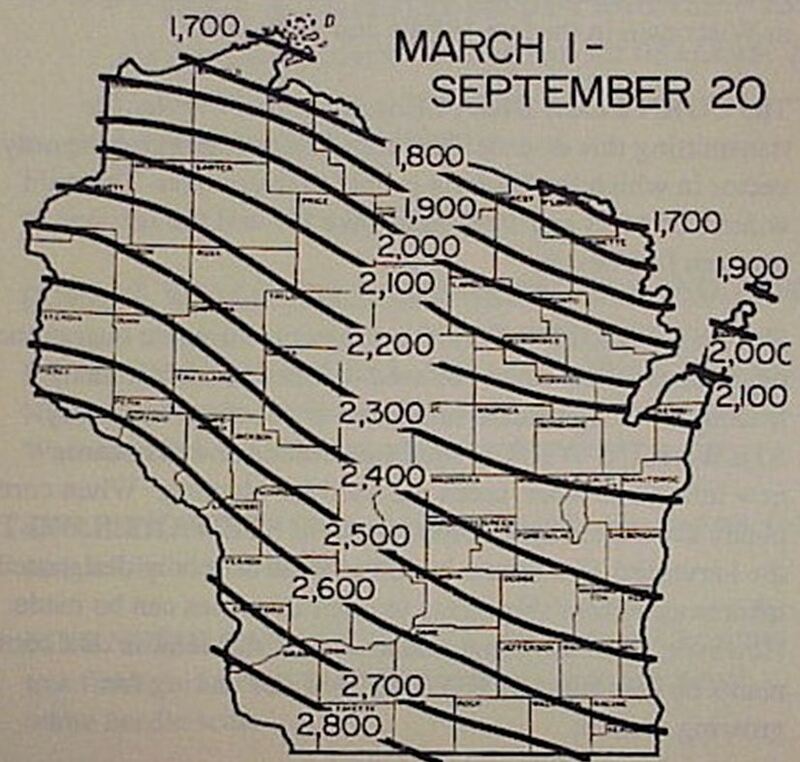 Typical kernel development in Wisconsin. Frost has no affect on yield at this point. However, lodging from disease, insect damage or hybrid can result in physical loss of yield. Relationship between kernel growth stage and development. * Black layer formation and/or milk disappearance from kernels under development. Premature frost or extended cold temperatures may cause black layer formation at earlier stages and wetter moistures. 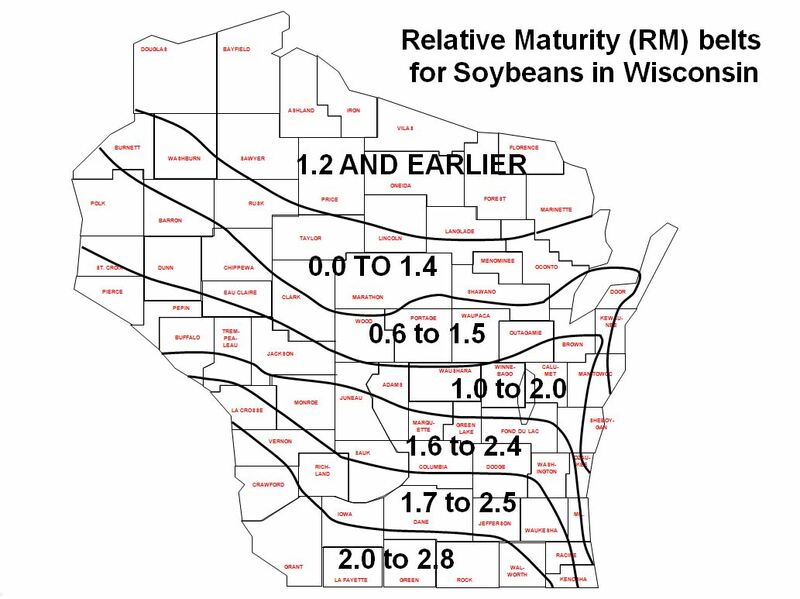 For most of Wisconsin hybrids (~100 day), each plant typically develops 20-21 leaves, silks about 65 days after emergence, and matures about 120 days after emergence. All normal plants follow this same general pattern of development, but specific time intervals between stages and total leaf numbers developed may vary between different hybrids, seasons, planting dates and locations. The rate of plant development for any hybrid is directly related to temperature, so the length of time between the different stages will vary as the temperature varies. Environmental stress may lengthen or shorten the time between vegetative and reproductive stages. The length of time required for the yield components of ear density, kernel number, kernel weight varies between hybrids and environmental conditions (Fig. 1.). 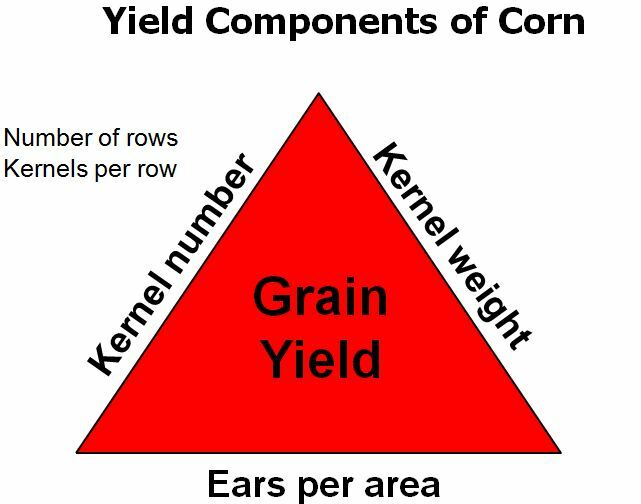 The yield triangle once again emphasizes the important yield components of corn. One of the important aspects that should be recognized is the earliness at which yield is actually determined. It is true that yield is the end product but a numbers of stages are required to produce yield. This won't necessarily put "money in your pocket", but by knowing when yield components are determined helps us to interpret management and environmental factors influencing yield. Potential = maximum number or size; attrition always occurs. Actual = result of growth process after attrition. May 1 in southern Wisconsin.